Pork chipolata sausages wrapped in oak smoked, dry cured streaky bacon rashers. 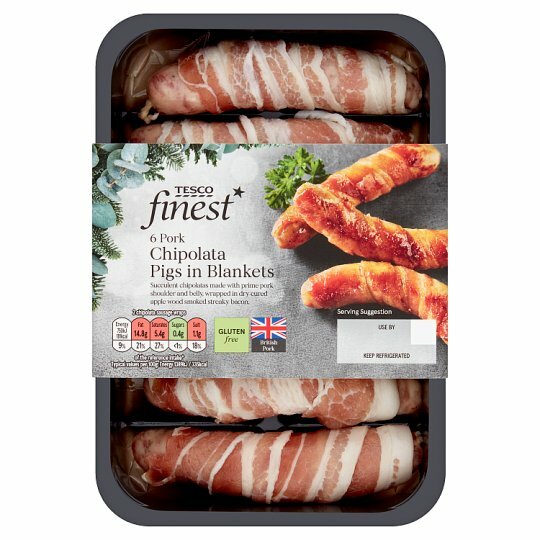 INGREDIENTS: Pork (96%), Salt, Potato Starch, Water, Dried Herbs, White Sugar, White Pepper, Preservative (Sodium Metabisulphite), Nutmeg, Preservatives (Sodium Nitrite, Potassium Nitrate), Antioxidant (Sodium Ascorbate). Sausages flled into natural sheep casings. Suitable for home freezing. Ideally freeze as soon as possible after purchase but always by date shown., Keep refrigerated. Once opened, consume within 2 days and by 'use by' date shown. Instructions: Place on a lightly greased baking tray in the centre of a pre-heated oven for 25 - 30 minutes. Turn occasionally. Instructions: For best results, grill. Remove all packaging. GRILL Medium Chilled: 12-14 mins. Place under a pre-heated grill for 12 - 14 minutes. Turn occasionally.